A 20th century coastal cannon near Fort Dickens is now there for display, not warfare. 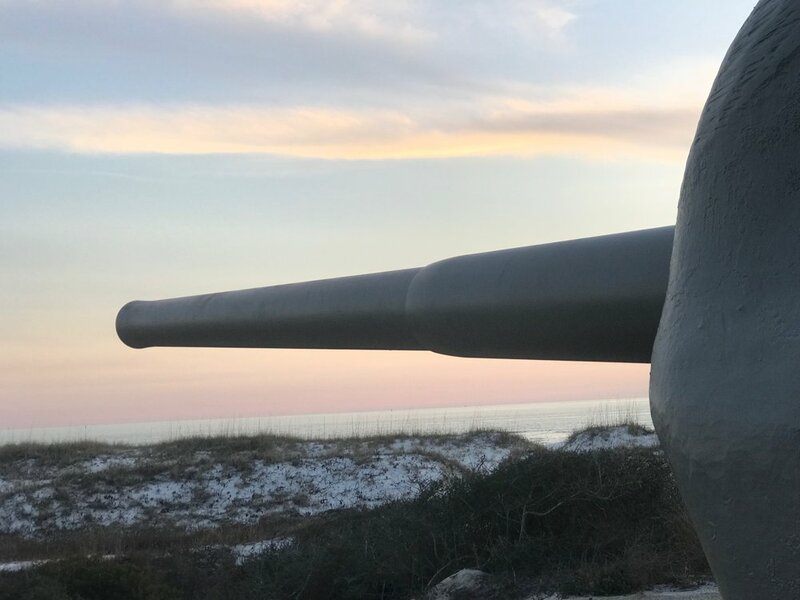 Battery Langdon, a World War I vintage coastal battery on the Florida Panhandle, could hit a target 17 miles out to sea. nside the oldest part of Fort Pickens, built in 1834. Fort Pickens was built to protect the entrance to Pensacola Bay. Gulf Islands National Seashore was closed, and campers evicted, when the federal government shut down Jan. 20. Pensacola – Government has always had a hand in this part of the Florida Panhandle, and here I was, camped on government land, when the government ground to a halt. For centuries Pensacola Bay was a site for forts flying the flags of Spain, France, England and the United States, whose purpose was mostly to declare authority over territory they didn’t know what to do with. Besides bragging rights, the Panhandle didn’t have much to offer until air conditioning came along. The sandy soil wasn’t good for growing most crops, and Pensacola Bay, while large and deep, didn’t lead anywhere. Hot and sticky much of the year, the Gulf Coast was plagued by tropical diseases and frequent hurricanes. But Pensacola had a resource of particular value to a young nation in need of a navy: forests of live oak trees. The live oak produces dense, strong timber, and its branches grow at angles useful in building large wooden ships. The “iron” in the hull of Old Ironsides came from southern live oak. So President John Quincy Adams established the Pensacola Navy Yard to help build the fleet, and the nation’s first federal tree farm, the Naval Live Oaks Reservation, to provide the raw materials. Then the government built three fortresses to protect the Navy Yard and guard the coast. Enslaved Africans did much of the work because free whites found the pay lousy and the conditions intolerable. Fort Pickens, the largest of the forts, has been guarding the coast since 1834, serves as a museum of coastal defense technology. 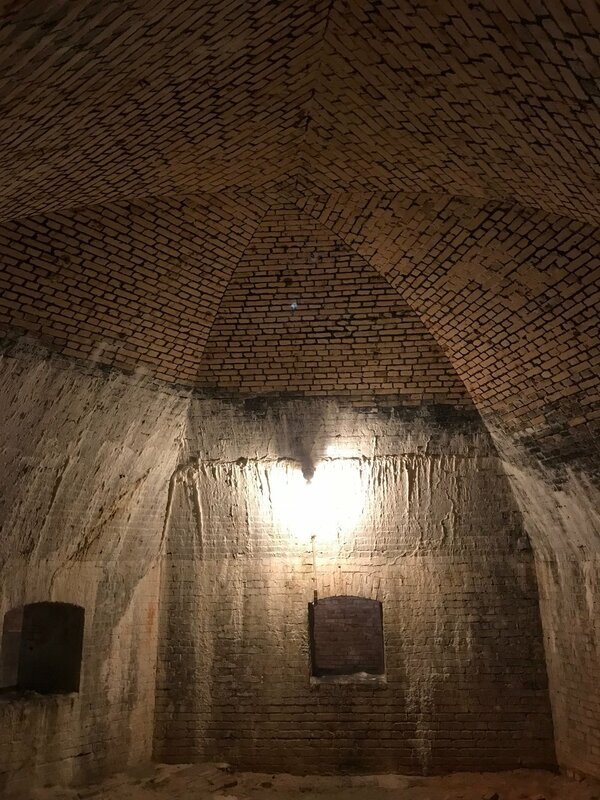 The original stone fort is mostly intact, but a section had to be removed in 1898 because it obstructed the line of fire for a new battery of bigger guns, built in the middle of its parade ground. Nearby are World War I and World War II vintage guns, each one bigger than the last. Some are camouflaged by sand dunes. Some were designed to pop up, shoot, and hide again. The guns at Battery Langdon could hit a target 17 miles out to sea. All this firepower has never been used against a foreign threat, not a single shot. That’s true of nearly every coastal fortress built by the U.S. over the space of 150 years. They may have deterred foreign invasions, but they didn’t fight any off. The only battle Fort Pickens fought was in 1861. After Florida seceded, Confederate forces seized the Navy Yard and two forts across Pensacola Bay. But Fort Pickens had the biggest guns, and in the artillery battle that followed, they destroyed the closest Confederate fort, then destroyed the shipyard the fort was built to defend. With no reason to stay, the Confederates left town. Fort Pickens, like nearly all of America’s coastal forts, was abandoned after the end of World War II. Their guns couldn’t stop long-range bombers or guided missiles at the coastline. Satellites now stand guard, not stone sentinels. New technology makes old technology obsolete. It is now part of Gulf Islands National Seashore, which stretches along 160 miles of Gulf coast. The National Park Service manages the crumbling forts with their rusting guns, along with the sparkling beaches and critical wildlife habitat on the barrier islands. The islands protect the mainland in ways the forts never could, by blunting the impact of hurricanes and storm surges. The NPS also manages the campground next door to Fort Pickens, which is where I found myself when the federal government shut down. The government had run out of money – again – because Congress and the president couldn’t agree on something. Our travel plans had fallen victim to Washington’s paralysis. We were given until 4 p.m. Saturday to get off of government property. Pensacola and its people still rely on the federal government. Naval Air Station Pensacola, just across the bay, is a major employer. Its Naval Aviation Museum and its aerobatic team, the Blue Angels, are a great source of pride. The government’s leaders in Washington, not so much. It’s not the inconvenience of the shutdown that rankles. We found a fine, privately-run campground a few hours down the road. After three days, federal offices opened up again – at least until the next shutdown showdown. But the shutdown reminds us of how easily Washington’s dysfunction can mess up the lives of people far from Capitol Hill. It hurts because it’s another depressing example of how America’s democracy has become as ineffective as the guns of Fort Pickens.